Motorola Moto X Available to Order Now! The Motorola Moto X is expected to be a surprise hit among mobile users this year and here we take a look at what the phone brings to see if it really can become one of the best smartphones of 2014. One of the main selling points of the Motorola Moto X is the “always on”set up of the phone. Always ready when you need it the Motorola Moto X responds to your voice commands to create messages, call contacts and more. You simply say “OK Google Now”and the phone is ready to go, it can also be set up to recognise only your voice so you can use it in crowded places or keep it secure. The phone also includes some intuitive gesture controls such as a simple twist of the wrist and the camera fires up so you can capture that special moment. The technical stuff under the hood includes a 1.7GHz dual-core processor, Android 4.4 KitKat and a powerful battery that delivers up to 576 hours of standby time. The large 4.7-inch AMOLED display delivers a responsive experience and even when the phone goes into sleep mode you can see notifications displayed on the sleep screen so there is no need to touch the handset. The chassis has been designed to fit perfectly into your hand and with a twist of the handset you can fire up the 10-megapixel camera so you never miss the action. Various shooting modes let you add different effects to your photos and there are plenty of editing features to create great images. The Clear Pixel technology captures more light so you capture your subject perfectly and of course you can share the moment with friends and family on your social networks easily. As you would expect from a high end smartphone you get 4G connectivity and Wi-Fi for web browsing and downloading new apps, and the Motorola Moto X also includes NFC, DLNA and GPS. The Motorola Moto X is now available for pre-order so you can be among the first UK people to get hold of one. Motorola Moto X dealsare available on a number of networks and can include data, minutes and text allowances to suit you according to your usage. 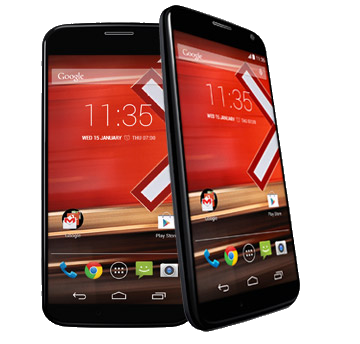 Do you think the Motorola Moto X can take on giants like the Samsung Galaxy S4 or the latest iPhone? Would you buy a Moto X? Tell us your thoughts by commenting below or joining us on Facebook, Twitter or Google+.